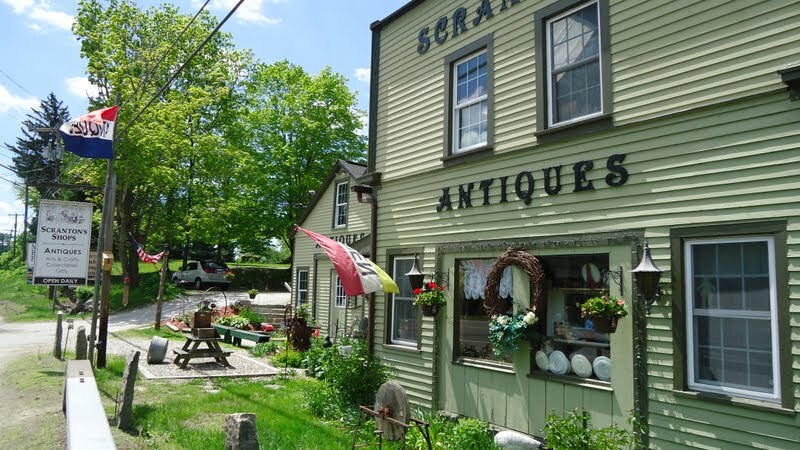 When last you saw us, two adventurous sisters were making our way through the Connecticut countryside with a list of eateries and sights to be seen! Sadly, our ice cream was now gone and it was time to continue on the roads less traveled. Our bellies were primed and ready for the delights ahead of us at the Golden Lamb. We drove the windy, tree-lined Connecticut roads with our senses alert, in order to not miss a thing. Then, like a mirage in the desert, a strip of adorable antique shops appeared on the bend of one of the roads. And it couldn’t have been more perfect if I had planned it, but there was a tea house smack dab in the middle of the strip! 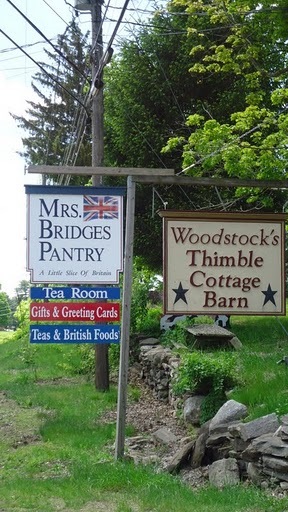 Mrs. Bridges Pantry is in Woodstock, CT. and the perfect destination for a ladies’ day trip! I have actually come across their name a few times when searching out tea houses, but never added it to an agenda due to bad reviews. BUT, there are new owners! And one of the owners is actually from England! That sounds like the perfect set up for a spot of tea! Unfortunately this was an unplanned stop, so our stomaches could not meet the enthusiasm of our eyes. A full afternoon tea would have to wait for another day. For today, I would start with the Mint Julep Iced Tea and Debbie went with the Darjeeling hot tea. My tea was perfect with a hint of bourbon flavor and some fresh mint leaves. The next decision was what could be eaten without ruining our destination lunch at the Golden Lamb that would take place in 2 hours. 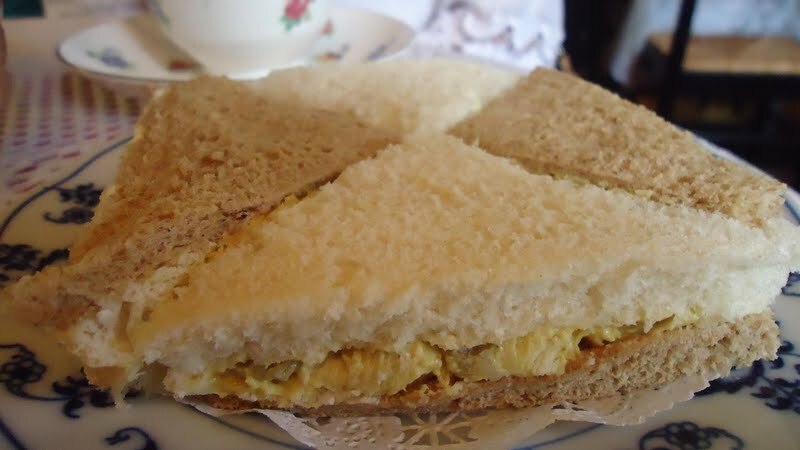 We decided to split the curried chicken salad tea sandwich and take a chicken pie to go. We had a shotty curried chicken experience at a tea house a few years back, so I was skeptical. But boy, was my risk paid off with reward! This chicken salad was subtle in every way. Just a hint of curry, a touch of creaminess, and a bit of sweetness. It was as perfect as a tea sandwich can get. We took our chicken pie to go, and only made it to the parking lot before we had to have a taste. The crust was flaky and not overly buttery, and the filling was more chicken than anything else (which is a good thing). Again, another perfect dish. Although our time at Mrs. Bridge’s Pantry was short, this road-side surprise has a place as one of my all time favorite stops. 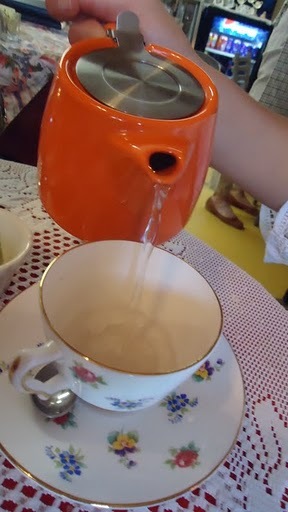 I cannot wait to get back to try a full tea! But, there was no time to contemplate what could have been….it was now REALLY time to get to the Golden Lamb! To be continued…. 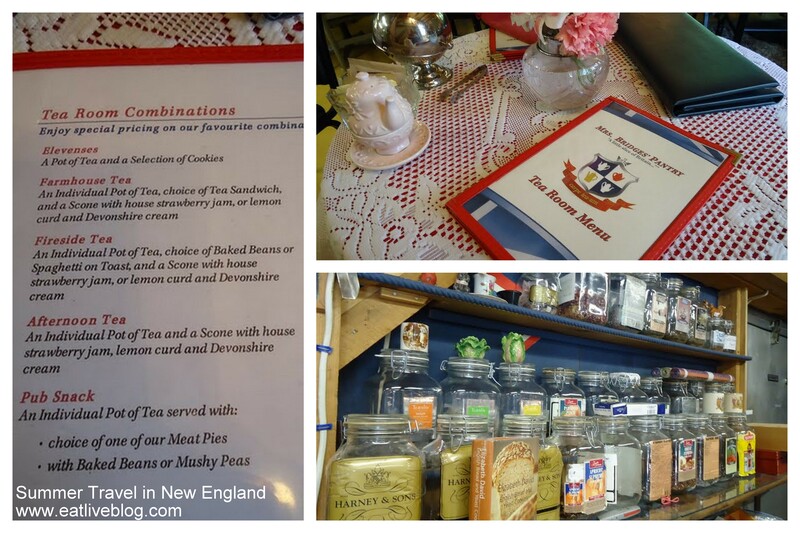 This entry was posted in Reviews, Travel in New England and tagged afternoon tea, connecticut, new england, road trip, snack, tea, travel by reneeh. Bookmark the permalink. This place looks phenomenal! I will put this on my list of places to check out when we’re passing through CT.
Renee: Thank you for such kind words. My wife, Pam, and her biz partner, Sue, have been devoted to the shop since taking it over in mid-2008. The ladies put their hearts and souls into creating a comfy place for women of all ages and even us guys!! Positive reviews help Pam and Sue more than you know.